The official start of summer is quickly approaching and the season usually brings vacations for many of us and for some Academy Members, half day Fridays. With a slimmer workforce and/or hours, how can you ensure that your team is as productive as other seasons? The most consistent and persistent traits we have seen in working with Academy Members has been not only that they plan their work, but they know how to masterfully work their plan. 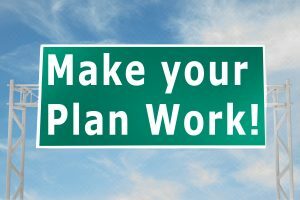 Planning your work is the strategic planning process and includes being clear about your goals and outcomes so you can create a plan to achieve them. This process should take into account the resources at your disposal as well as any roadblocks so you are prepared, delays are minimalized, and you and your team aren’t derailed. Working your plan is the execution process. It involves the series of milestones, strategies and actions to make your plan a reality. You may be thinking… “But not everything that needs to get done rises to the level of needing to create a plan.” I invite you to consider that everything in your business and personal life can be considered a project – some simpler involving 1 or 2 people, while others are more complex and require a team of people. Clear Goals: A project without clear goals will confuse and frustrate your team. It’s important to be clear about the big picture commitment and goal of the project. How will the creation and completion of this project support the vision of your firm? What does successful completion of this project look like? Communication with your team is important so they are inspired and know where they are headed and why. Don’t assume that because you shared this once, they remember and will continue being inspired by it. As a leader, it is up to you to continue communicating the vision to your team so they’re continuously engaged. Establish a thorough actionable plan with a timetable: Always start with the end in mind. Have a date penciled in for when the entire project will be complete. Then stand in the future and envision what the project looks like as a wild success. What did it take to get there? You can identify the top-level strategies first, then breakdown each of them into more detailed tasks and actions. Make sure your plan includes enough detail to ensure your team is set up for success. In fact, include your team in the creation of the plan. More brains are better than one and they will naturally have more “buy-in” if they were part of design process. When setting milestones and deadlines, work backward to create your plan – meaning from the future to the present. Consider using a project tracking document or software program to ensure every task and action is assigned to individual team members with deadlines and it’s accessible to everyone. At the Academy we use Basecamp to track projects and tasks. Know your key players and ensure they are the right fit: In your project plan the “who” component should include: 1) Roles and skills needed and; 2) Who on your team will fill those roles. Your team should have the skills and knowledge needed to execute on the project. In your plan, be sure to consider whether some training and mentoring can fill the gap or if you need to outsource some of the work your team is not uniquely skilled to accomplish. Communication and accountability: It’s imperative that each team member understands their role in the project and there is a level of accountability for completion. Without communication and accountability, your entire project may either fail to launch or be easily derailed by circumstances. Lines of communication should remain open. This includes communicating about any roadblocks, delays or issues early on in order to avoid big problems down the road. Consider including project update meetings in your plan on a regular basis to ensure the plan is being executed smoothly. Time management: It may be necessary for you and your team to brush up on some basic time management skills to ensure the project stays on track and is a priority. Otherwise, the “tyranny of the urgent” may reign. Being idealistic about how much we can get done in any given day without being realistic with our time management plan is a recipe for disaster. Make a list of all your time vampires and what may get in the way of designated project time so you can prevent them from derailing you when they show up. When you feel stopped, blocked or find yourself coming up with “reasons why not,” ask yourself, “what are my goals?” Then how can you devise a plan to divide those goals into milestones? Some can be short-term while others long-term. Sometimes just realizing there is a simple way to reframe anything in the form of a project is enough to get things moving again.